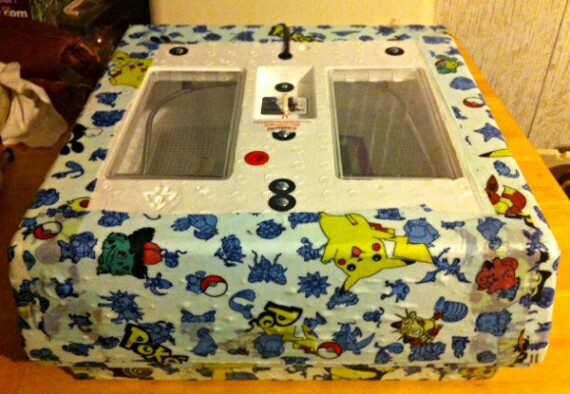 Pokebator: Gonna hatch ‘em all! So have I ever told you about my fear of styrofoam? We now have two incubators and, for those of you unfamiliar with them, they’re made of styrofoam. So what’s a slightly-off-her-rocker gal to do? Modge Podge & Pokemon fabric! We now have two dozen turkey eggs, two dozen duck eggs, and ten goose eggs in various stages of incubation. The first of them should be hatching out in a week or so. We bought the turkey eggs from a wonderful local lady we recently met, Gail. The other eggs came from Bob, mighty leader of our Boy Scouts and an animal control officer to boot. Ducks and geese at one of the local parks lay eggs and then kids come along and smash them. What a waste. So he’s been collecting them and giving them to us to hatch out for ourselves. Good stuff! He also let us know about a hen and chick at the humane society a week or so ago. They’re not really set up for birds and wanted them out of there ASAP. We bopped over there the next day and picked them up but it turns out that the chick did not belong to the hen. The hen went out to be introduced to our flock and we built a small brooder for the chick. (We had a few brooders already but they’re big, not appropriate for smaller amounts of chicks.) 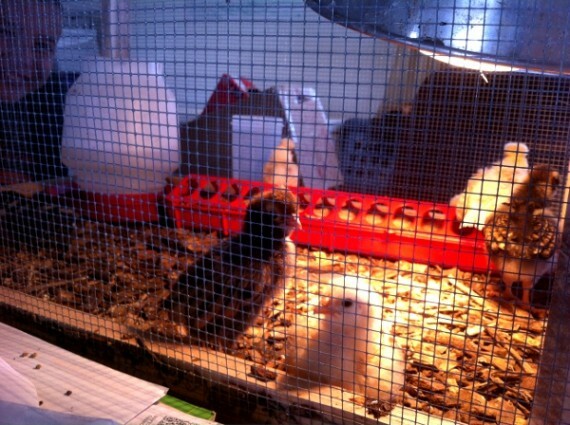 Of course, one lone chick is a pitiful thing so we went and bought him a half dozen friends from the farm store. I did a bee check today. A fella came out to interview for the local paper this morning, doing a story to help us get the word out about a new 4-H beekeeping club we’re starting up. While I was already suited up and showing him the hives, I went ahead and dug through them all. The bees were very well behaved for us. Thanks for coming out, Matt! Fred, the 2011 Italian hive, is doing well. This is the hive that split & swarmed. So, while it is smaller than what it was, it’s doing fine. Lots of nice brood in there. Phyllis is still very small and I’m just not sure how that’ll all work out. Our local beekeeping meeting is tomorrow evening so I’m sure I’ll get some good advice on how to handle it. Hans Huberman is doing great! Beautiful comb being built. The new swarm hive completely wowed us. Every frame was filled with bees and comb. Gorgeous, creamy white comb! I added a second medium to it, knocked off the entrance reducer to add a boardman feeder from one of the empty hives, and gave it one of the outer covers from the same empty hive. (Originally, I’d put an empty box on top and gave it a tub of syrup, along with a Rubbermaid tote lid as a temporary cover.) I love, love, love this hive so far. We’ll have to give it a name soon and either give it a real hive stand or move it to one of the existing ones. All in all, losing all of those packages was pretty tough but we’re already over it and moving on. I’m sure there’s some Giant Life and/or Bee Lesson in all of this that we’ll figure out later. I’ll try to read up on making splits and, eventually, someone will call us to collect a swarm or two. In the end, we’ll come out just fine. The Sugar Snap peas are up and doing well. The broccoli & cabbage are growing… slowly. The self-seeded lettuce patch is loving the spring and the lettuces I recently seeded are up. All of the pulled (potato) sprouts got bitten back by frost. Since there are no tubers under them, there are no reserves from which they can spring back. I’ll replant those rows with something else, maybe the TPS (potato seedlings from True Potato Seed). The onions I started from seed this year were perfect! I’ll definitely be starting my own from seed from now on. I love Dixondale but you all know how much I like being able to collect seed & start them myself. But, this year, I’ll have to buy some plants from a local store. We had just one too many frosts/freezes after I set them out. Some will come through it but some are completely gone. All of my mass-planted seeds are now separated, potted up, and living on the front walk (except for frosty nights). In an effort to reduce the amount of potting soil I go through each year, I’m trying to keep most of them in 6-pack cells. If I’m going to sell them, I’ll probably pot them up because people just won’t pay what the time and supplies are worth for the smaller plants. Then again, once I pot them up and put that time & expense into it, there are so many unsold ones at the end that it’s not really worth it, either. I need to get better at estimating what I’ll use + what I’ll sell + what I give away. Heck, I give away far more than I sell each year. That might be part of the problem. Heh. But, yeah, the sidewalk is still crowded with seedlings. Sounds like things are coming along. I can’t wait to see everything in May when I come. How much are your tomato and pepper plants. I know Norma wants some more this year. I will try to get a list from her as to what she wants before I come. Will they be ready to go by then? Yep, the seedlings should be pretty big by then. And they’re free, silly. I’m just talking about selling at the farmer’s market and that sort of thing. Al said it sounded like you were starting a fowl farm, or did he mean “foul”. That’s a lot of birds. Just to kick things off around the time we started incubating the eggs, we sat down and watched a movie with the kids: “The Birds”.